This requirement came from a customer more as a general query rather than a full demand, but I thought it should be an interesting enough problem to invest some time in. 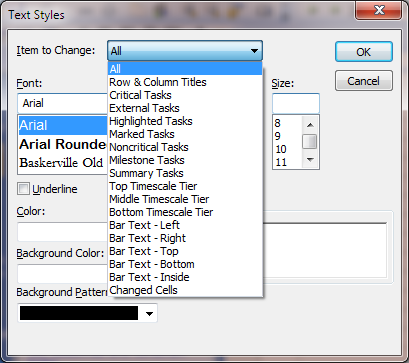 Changing the font, colour, or any of the other options available under Format | Text Styles can only be done automatically for a certain set of (Microsoft determined) pre-defined tasks. The only option left for the PM is either to use the “Marked” column, or to resort to code/VBA. 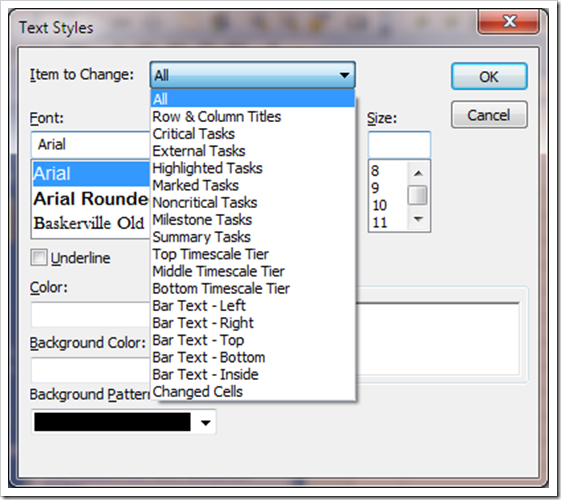 So, the original request was to change the colour of the text based on the % complete. This is relatively simple, we can accomplish this using the following statement. Loop through all the tasks, and for each task that is not a summary or blank task, do the following…. The second issue is that the cursor moves as it loops through the tasks, so it is worth saving the original location of the cursor, and then resetting that when the code as run. I’m no coder, but the above works, and it wouldn’t have worked without the input of both Nico (via the forums whose published code I borrowed) and Catalin Olteanu and Rod Gill who answered specific queries – thank you all.